Famously rumpled director, writer, and creep ~Woody Allen~ was spotted in a few different spots around San Francisco this week. A reader wrote in to let us know they spotted him at Capannina on Tuesday. He was with a male friend and apparently has been in before. On Thursday, he also stopped in at Balboa Cafe, of which he is reportedly a fan, and then again later in the week with his wife Soon Yi. We also had a reader write in to let us know they heard he’s been at Perry’s not once, but twice. Turns out, he’s a fan of Union Street! He also came in to the brand-new Farina Pizza & Cucina Italiana for lunch last Monday with six guests, all of which were reportedly in showbiz: one was from Rome and two others spoke Italian. Photo of Woody looking over it courtesy of Esperpento via Mission Mission. 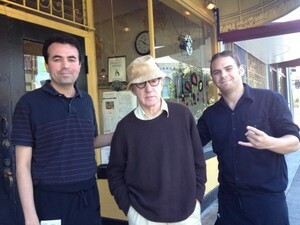 The ever-bespectacled ~Woody Allen~ continues his culinary tour in San Francisco, stopping at Esperpento in the Mission according to Mission Mission, and Leah Garchik reports he also dined at Zuni Café.